Sometimes you may not have a Wifi Connection available nearby you, but you always wished for it. Well, there is a Windows Application called Connectify for it. 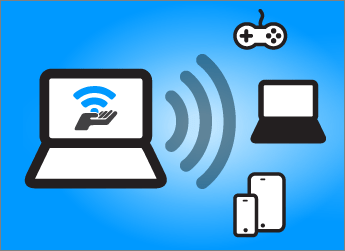 Using Connectify, you can turn your PC/Laptop into a WiFi Hotspot and share the Internet with all your devices. Good thing, no complex settings, no configuration, just simple installation and then select the Connection you want to share using Wifi, volla ! there you have wifi access for all your Wifi enabled Gadgets. The Video in this post, explains all the steps need to start a Wifi from your device, without any Wifi Router. Connectify is available in two modes, Free and Pro version. Free allows you to use the software, with limited settings, while Pro allows you to configure your SSID name, select Automatic Connections and much more.